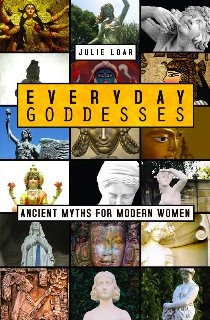 Everyday Goddess: Ancient Myths for Modern Women by Julie Loar, BookSurge Publishing, 450 pages, $17.99 paperback. For more than 30 years, Julie Loar has been a student of metaphysics and symbolism. She also is an astrologer and tarot reader. Her research has taken her around the world to sacred sites, and every year she leads a tour of Egypt to explore ancient, sacred spots. Loar shares her insights along with the wisdom of goddesses from around the world in her fourth book, Everyday Goddesses: Ancient Myths for Modern Women. The book features a goddess for every day of the year, arranged by cycle, season and zodiac. Every culture on Earth has marked time by tracking the motions of the moon and the path of the planets against the background of stars. In fact, the zodiac has been called the “Girdle of the Goddess,” Loar writes. Every month of an adult woman’s life is a complete cycle of birth and death called menstruation. The cycles at one time were important to society, and women who had completed that cycle and entered a new stage once were revered for their wisdom. Today, we value the maiden and the mother more than the crone. Loar has arranged her book as a meditative journey through the year. Goddesses associated with dawn and new beginnings appear in the spring. Goddesses associated with birth appear in the summer. Goddesses associated with the harvest appear in autumn and goddesses associated with death appear during the dark time in the Northern Hemisphere, winter. Additionally, Loar perceives an alignment between the symbols of the zodiac and ancient symbols of the sacred feminine, such as birds, trees, serpents and spirals. For example, we are now in Sagittarius, a mutable fire sign that embodies the idea of illumination. The symbol for Sagittarius is the hunter or the archer. The goddess symbol for this time of the cycle is the bow and arrow. Some of the most ancient goddesses were hunters of the primeval forest, guarding the animals who lived there. The goddesses throughout this book are complex and contradictory: they are gentle but fierce, creative but destructive. They are strong, wise, brave and loving. Loar shares the myth or sacred story of each day’s goddess along with a contemplation. “In Western culture we have devalued, even demonized, aspects of the feminine for nearly 4,000 years, effectively pushing these archetypes beneath our conscious awareness,” Loar writes. Her book attempts to bring these archetypes back into consciousness by providing contemplation for each day of the year based upon a sacred feminine image. The book can be used as a daily meditation or as an oracle. The reader can set an intention or ask a question, and let the pages fall open and the divine feminine will speak. Loar presents a simple concept: provide a goddess a day for contemplation. Yet no other book has aligned the goddesses with the cycles and the seasons, with the zodiac and the symbolism. Her book is a tool to create empowered women one day at a time, to turn every woman into what the ancient Egyptians called a nutrit, a little goddess.